What if the pump box doesn't fit inside the piano? Will the pump make my player piano play? How quiet is the pump? View the video -click here. Tired of Pumping your player piano. 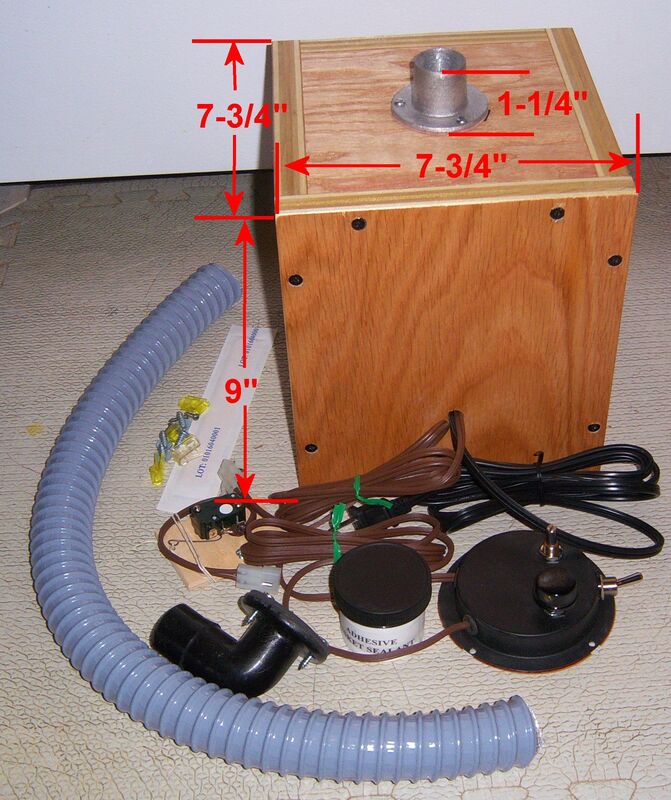 This vacuum pump produces from 1"-75" of water vacuum (WC). Enough to compensate for a lot of leakage. The 'Kit' also contains our new Independent Dual-Speed Electronic Voltage Controller for adjusting the volume of the music and how fast the music roll is rewound. 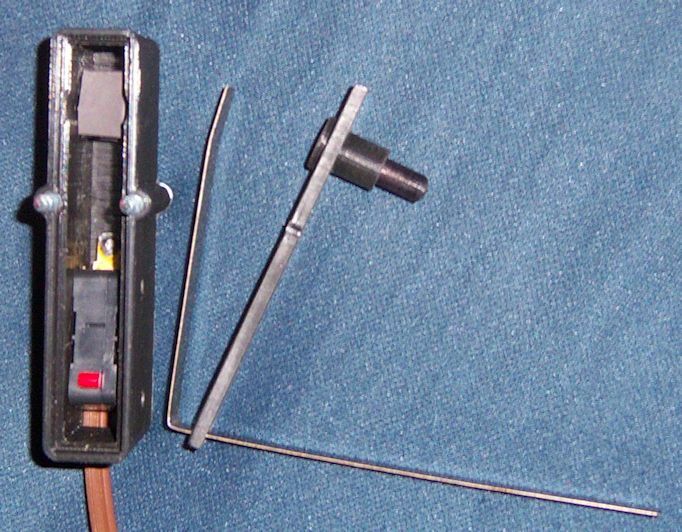 The inter-connecting tubing, wiring and all necessary connectors are included. Easy to install. One year guarantee on the electronic parts, and a five year guarantee on the vacuum pump. Space required for the pump is 8" square by 10" high, normally installed in the bottom of the piano on the right hand side of the Exhauster Assembly. The Dual-Speed Motor Controller shown in this kit is now available separately for $210.00 (includes sensor switch and mounting hardware). Contains everything in the 'Regular' kit plus an Auto Re-Roll Device and an Auto Shut-Off Device. 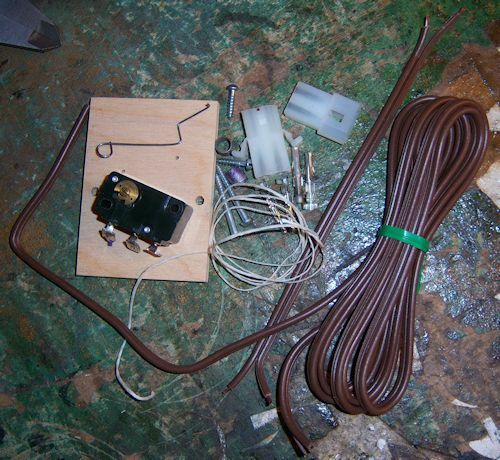 Everything you need to Electrify and Automate your Player Piano. 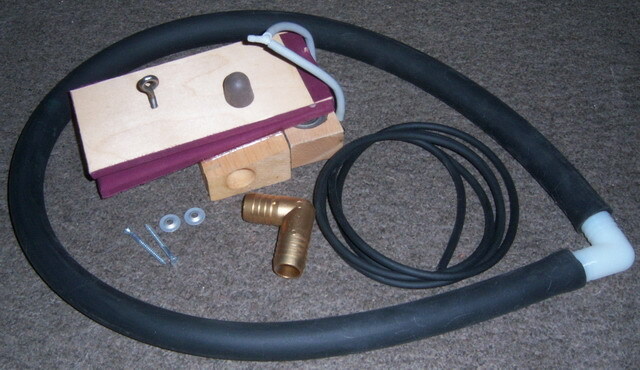 Complete with installation instructions, tubing, connectors and wiring. Playing a roll becomes a 'push-button' operation. One year guarantee on all electronics, five year guarantee on the vacuum pump. Space required for the pump is 8" square by 10" high, normally installed in the bottom of the piano on the right hand side of the Exhauster Assembly. Installation Instructions/Diagram/Pictures -click here. To place an order, Click Here. Designed primarily for players that have already been electrified, this device will shift the transmission from Play to Rewind at the end of the music roll. It is triggered into operation by perforations that are located a few inches past the last playing notes, which are common on almost all music rolls. To view the Installation Instructions, click here. The cost is $179.50, which includes 3 ft of vacuum supply tubing, connecting elbows, trackerbar tubing, and associated mounting hardware. Shipping charge is $19.95 within the US and $48.00 to most overseas countries. Insurance is additional. To place an order, Click Here. To purchase replacement block valves for this device -click here. This is the Automatic Shut-Off and Pushbutton 'On' Device that's part of the Full Automation Kit. 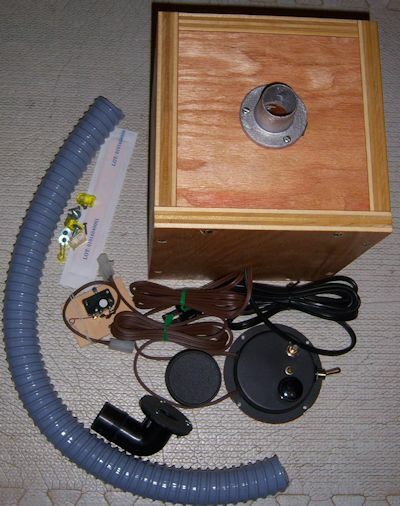 It comes with about 8 ft of line cord, required hardware, and instructions for mounting the unit in the spoolbox. This device can be easily wired into an existing electric vacuum pump system, and takes the place of the regular on-off switch. In fact, you can leave any existing on/off switch in place. Just leave it 'on'. Cost is $129.00 ea. Minimum Shipping charge is $7.95 within the US. $38.50 to most overseas countries. To place an order, Click Here. What makes our Pushbutton 'On'/Automatic 'Off' device better? 1. Unlike every other device that's ever been manufactured, our device has a built-in guide for the pushbutton. This provides a much more positive action for the switch and the lever. Things stay straight in line, all of the time. Having the built-in guide also makes installation an easier process. 2. Unlike every other device that's ever been manufactured, our device isn't glued together. In the unlikely event that the switch fails, the bottom of the switch snaps off and on with ease. (see picture below) Face it. Things do fail. Isn't better to anticipate that failure and do something to make the repair easier? That's what we've done. 3. The stroke of the switch was shortened. This insures that your long-playing rolls will still work. 4. The touch required to turn the switch 'off' is such that even if the roll is rewound slowly, the power will always turn 'off' when the tab comes off of the take-up spool. . The old style Sensor Switch is available separately for $37.00. (See pictures below). The Cherry switch with the custom armature costs $19.00. 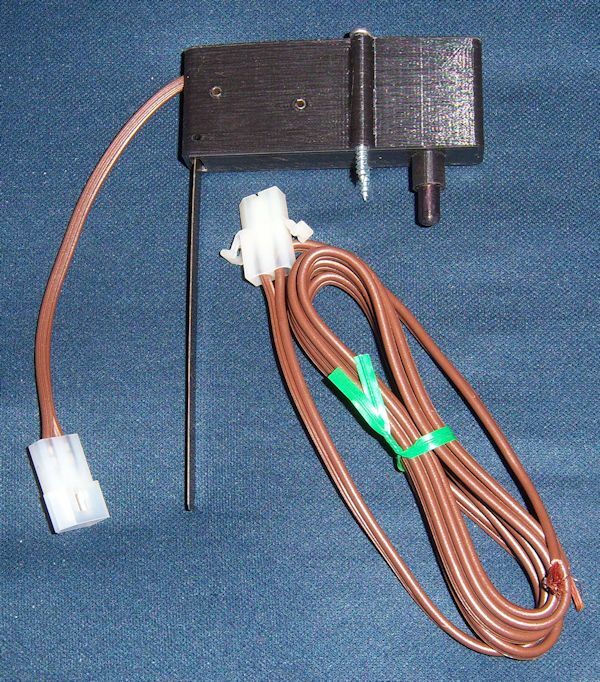 To place an order for the Sensor Switch assembly or the Cherry switch w/Armature, -click here. Specify what you want in the Comments Box on the form. Shows all of the parts used to make the assembly. As of March 28, 2019 we are offering pump motors with internal thermal overload protection. While this type of protection has never been offered since the pump kits were first introduced in the 1960's, we decided to start offering the option for only one reason; It is now possible to turn the vacuum pressure to a level that may far exceed the needs of the player system. Our newly redesigned controller makes it possible to turn the vacuum pressure of the pump up to over 75 inches of water vacuum (WC). And, if the player system is only using 30 inches to play at its maximum loudness, the pump motor will overheat because it's starving for air. (It's like driving your car while constantly pressing on the brake pedal, which will cause the engine, transmission, and brakes to overheat.) Our concern and decision to offer thermal protection was motivated by the fact that the pump kit might be installed in a player piano that isn't being properly supervised. One great feature of this particular thermal protection device is that it will automatically reset after the motor has cooled back down to a safe operating temperature. The additional cost for the thermally protected motor is $30.00. If you would like this type of motor, select "Thermal Protected Motor" when filling out the order form. 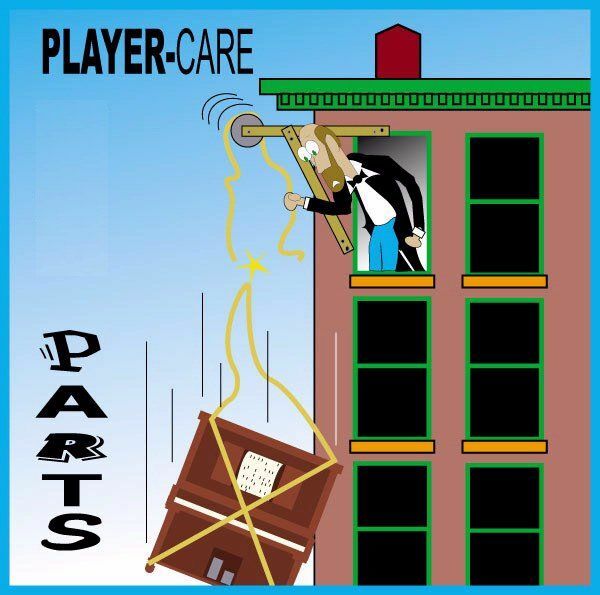 Player Piano Parts and Supplies: I have literally thousands of miscellaneous parts and supplies for player pianos; some new, some used. If you can't find it anywhere else, send me an email (click here) and I'll try to locate it for you. Since I no longer service or rebuild players, everything I've collected since 1972 is for sale. 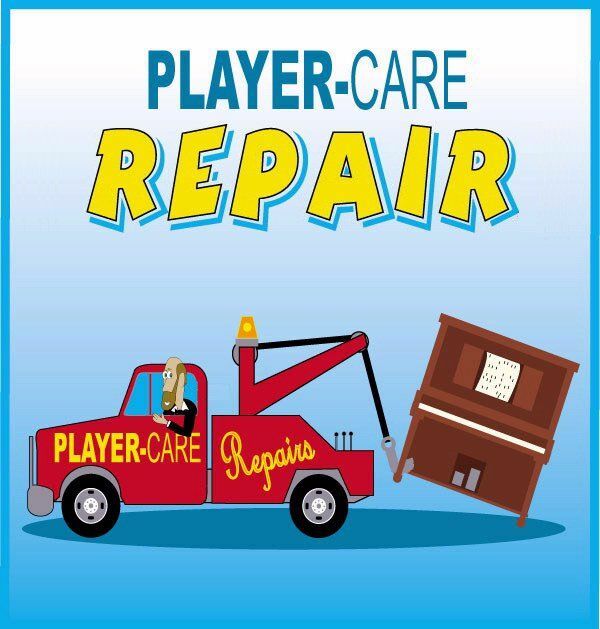 For more detailed information about how business is conducted at Player-Care -click here.